Let us help you with the design process for your new deck. We have over 250 designs already made for you to choose from, or we can create a completely custom deck for you. Materials – We use Wolmanized Residential Outdoor Wood for all our posts and framing. Wolmanized Wood is lumber that has been pressure treated with copper azole, one of the “new generation” or “green building” wood preservatives, as it contains no EPA-listed hazardous constituents. This wood treatment has been used around the world where special environmental concerns and/or restrictions exist. It can be stained or painted, and it is suitable for above ground as well as ground contact. Wolmanized wood will last longer and is resistant to rot, termites, and fungus. We also have an optional upgrade to Trex Elevations metal framing. If you are interested in composite decking, let us know. We use Trex to create composite decks that will last an average of 25-30 years with near-zero maintenance. Trex is a decking material made from recycled wood and plastic to create a composite deck product that will last you twice as long as a wood-only deck and requires practically no maintenance, just a yearly washing. Composite decking is also great because it won’t rot, splinter, or twist. Plus, it comes in a variety of colors, so matching your home and style is a breeze. Not to mention, the color is mixed in all the way through the material while it’s being made, so you don’t have to worry about the color flaking off or fading. You can even mix and match colors for unique, personalized accents. Railings – Railings are required on all decks higher than 30” from ground level. Trex offers many composite railings options, as well as powder-coated aluminum railings (similar in look and feel to wrought iron), to keep you and your loved ones safe on your new deck. 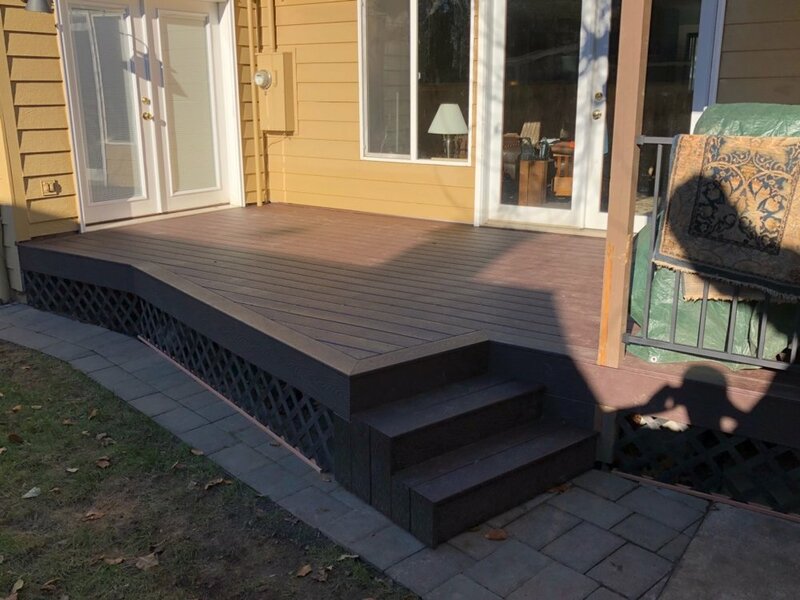 Through Trex, we can also offer you a “Cocktail Rail,” that not only matches your Trex deck, but provides you extra space to set down drinks, etc. while you are enjoying spending time on your new deck. Deck Lighting – Trex has several different options for incorporating lighting into your deck. Post cap lights that sit on top of the posts of your deck’s railing for a discreet, but well-lit area. Deck rail lights that are mounted on the side of the rail posts, and are available in in round and rectangular styles. Stair riser lights that are installed directly into the risers of the stairs to keep the steps of your deck well-lit. Recessed deck lights that are recessed into the deck itself, sitting flush with the deck boards, to offer light to keep you out on your deck all night long. Underdeck Drainage Systems – Underdeck drainage systems are a great option for multi-story decks. These can be installed on pre-existing decks, and easily be incorporated into a brand-new deck during the building process. Covered Decks – If you are thinking about making your new deck a covered deck, but you aren’t sure yet or your budget doesn’t allow for it, let us know during the design phase. We can include a few extra posts and footers to allow for a roof further down the line, without having to redo the deck. Ramps - We know as you age-in-place, stairs can become a hazard waiting to happen. We build custom wheelchair-accessible ramps to help keep you safe as you enter and exit your home. We build our ramps out of wood, concrete, or composite decking, and we can put a overlayment on top to boost your grip as you walk up and down the ramp. In addition to building your custom ramp, we also install grab bars and railing.